An Estes original! The first-ever snap together rocket! 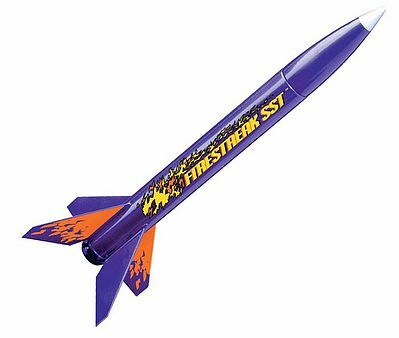 No fuss, no muss, simply snap the Firestreak SST together and get out and launch this hot looking rocket in minutes. Retail $10.99 SAVE 23% ! This is a GREAT rocket for launching in a large backyard. Recommend using a parachute recovery for this rocket to make the journey last longer. Nice rocket for younger kids. This easy to assemble rocket is fun to launch on 1/2A3-4T model rocket engines. Easy to assemble. Just snap together. Flights up to 350 feet. We&apos;ve used these in our summer camp for the older campers and they are alot of fun to both build and fire off. great activity. "Not real fond of this one"
I got this rocket from a friend, so I didn&apos;t actually build it, but the construction looked like it wasn&apos;t a very good design, as the inner BT is so small that packing the streamer becomes very difficult, and the outer bt is so heavy it keeps the rocket very low. I have had this rocket lawn dart at least twice before I officially decommissioned it. tho only good thing is that the plastic is strong enough that even after a catastrophic crash the rocket can be easily snapped back together, and at such a low cost it can almost be disposable. "Snaps Together and Takes Off Like A Bat"
I&apos;ve always been leery of snap-together plastic models, static or flying. But Estes did a superb job on this one: The cardboard motor tube is placed into one of the two plastic halves of the body. The other half snaps on tight and it really holds together with a near-invisible seam the entire length from motor retainer to the nose cone. I was impressed. But wait, there&apos;s more... Seems I forgot to insert the shock cord into the side of the motor tube before I snapped the body shut (duh...) so I had to take the two halves apart -- it wasn&apos;t easy, they really didn&apos;t want to let go of each other, but I managed it with careful persuasion. When I snapped them back together and they locked in just as tight as before. Amazing. The fins slide-snap into the plastic body sheel tight and solid as well, and the nose cone fit perfectly. It takes 5 minutes, tops. First flight was with a 10A-3T and it shot straight up and out of sight (Okay... it is a small rocket so that&apos;s not too hard,,, but it took a long time to come back into sight trailing its tiny streamer so it climbed way up there. Too high for the thin streamer to really slow it much as it came streaking down almost as fast as it went up. But no damage after the solid impact with the field. This thing is solid. Bottom Line: It&apos;s a tremendous amount of fun for a very little investment in time and money. But I&apos;ll fit it with a small custom-made cute for the next flight.